It's 2018, just a few years into the future. Somethings are better. Somethings are worse. 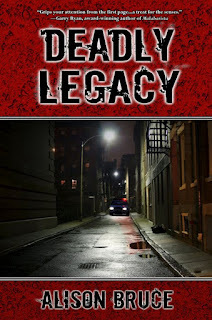 Deadly Legacy is a mystery that is one part PI, one part police procedural with a splash of speculative fiction and a dash of noir. Why is it set in the future? Because I wanted it to be part PI/part police procedural in a way that wouldn't work in the here and now. Besides, I had all this cool background research on the future of community policing and geeky technology stuff that I picked up doing other stuff. So, I created a near and probably alternate future. Like the old Max Headroom series, Deadly Legacy is set a few steps into a possible future. Shantytowns built from disposable consumer technology surround the city. Everything that you ever saw in a CSI or Bones episode is possible, but criminals aren't intimidated by forensic evidence because they've watched and learned from those shows too. Police hire consulting detectives because most of them are former police that got downsized. Somethings are better. Prejudice based on race, religion, and sexual orientation isn't the issue it is now. Somewhere between now and then, I've decided that we get a little smarter about that. Or maybe corporations will decide that kind of bigotry is no longer profitable. or maybe 0200 EDT 10.09.2012. Time is such a tricky thing. Hi Alison, Deadly Legacy sounds like a smashing read! I'm heading over to grab it now. BTW I love the cover. Those headlights coming down the alley (street?) are scary! Thanks Lyn. If you get a chance (and if you like it) can you give Deadly Legacy a review. DL is getting jealous of UATS. ;)I'm sure you know how that is. Drat! I missed picking it up free. But Deadly Legacy sounds like something I could get hooked into. Plan to pick it up on my next trip to Amazon! Words that every author loves to hear. Thank Cinette. I hope you'll drop back and let me know whether you enjoyed my book.